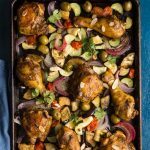 Moroccan Chicken roasted on a sheet pan with a mixture of vegetables is one of my all time favorite chicken sheet pan dinners because the taste is phenomenal! 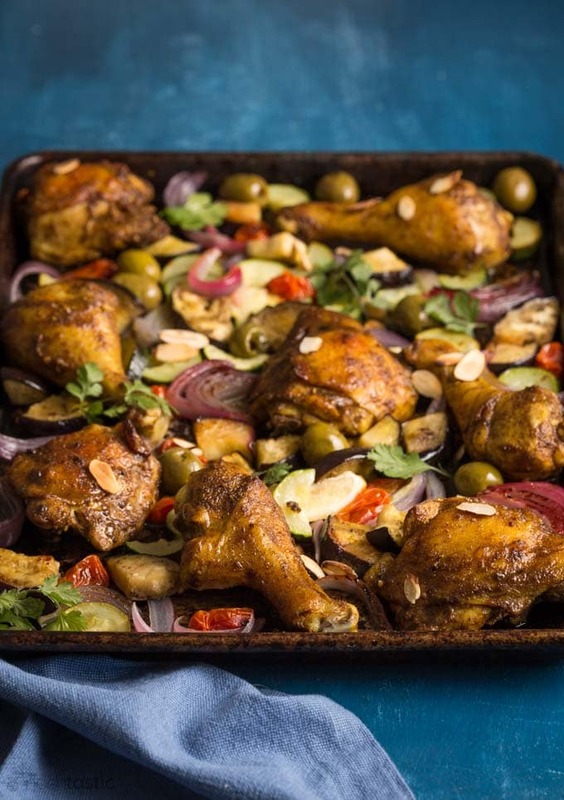 And no, this is not a spicy Moroccan Chicken recipe as the Ras El Hanout spice blend I’ve used has no real heat to it but it is packed full of healthy warming spices including turmeric, allspice, and coriander, that add tremendous depth of flavor to this simple oven baked dish. Then while it’s heating up you can chop and prepare all the vegetables and toss them so that they are properly coated in a little oil. You’ll need a batch of my Ras El Hanout Spice mix before you get started making your Moroccan Chicken, you can find all the spices you’ll need at the grocery store. 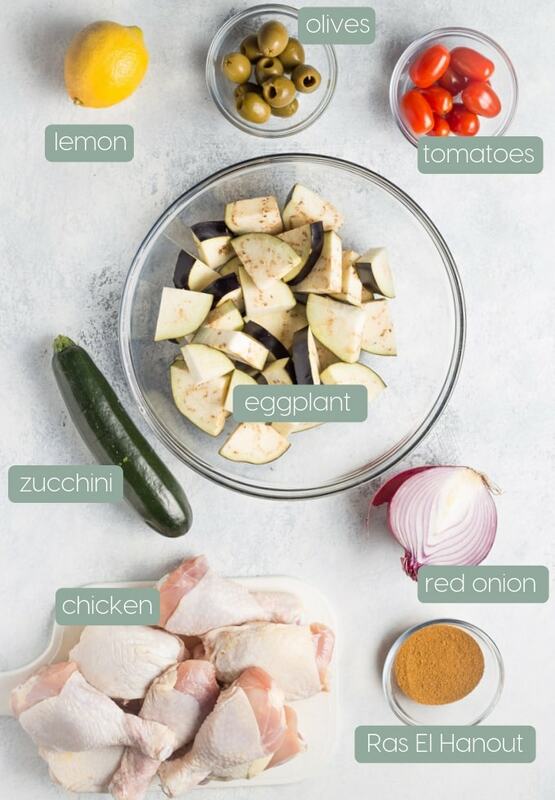 Then mix together the spices, olive oil, garlic, salt, pepper, and lemon juice and add the chicken and marinate in the fridge for about 30 minutes or up to 1 hour. Ras El Hanout is a blend of spices that originated in North Africa and is very commonly found in Moroccan cuisine. It typically contains warming spices such as cinnamon, coriander, cumin, allspice, turmeric, cloves, and pepper. Place the marinated chicken onto a sheet pan, you can line it first with parchment for easy clean up if you prefer, and then bake for 20 minutes. 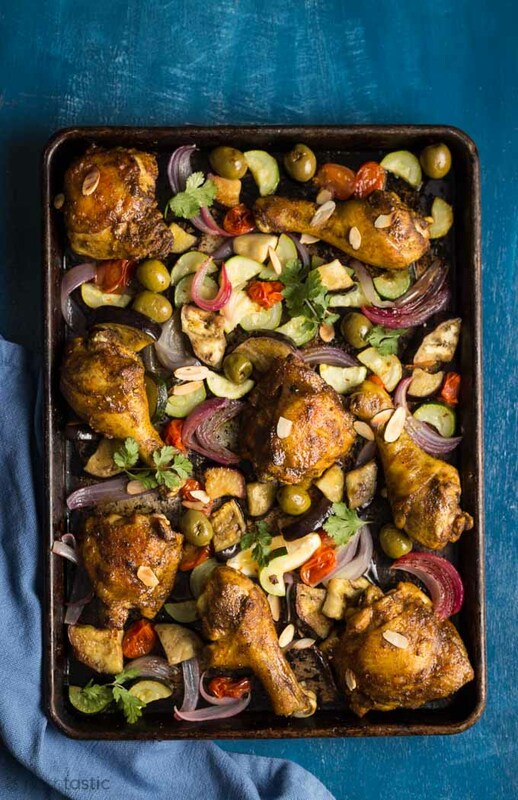 After 25 minutes remove the chicken from the oven and add the vegetables to the sheet pan and continue to cook for about another 15 – 20 minutes or until the chicken is fully cooked. I like to serve mine with a sprinkle of toasted almond and a couple of cilantro leaves. Mix the olive oil, Ras El Hanout, garlic, salt, pepper, and lemon juice together and add the chicken and marinate in the fridge for 30 minutes to 1 hour. Toss the chopped vegetables in a little olive oil, salt, and pepper so that they are evenly coated in the oil and set aside. 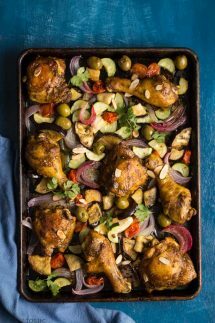 Place the marinated chicken onto the lined sheet pan and bake for 25 minutes, then remove from the oven and add the vegetables and cook for a further 15 - 20 minutes, or until chicken is fully cooked. Serve with a sprinkle of toasted almonds, natural yoghurt and garnish with cilantro. 8g net carbs per serving which includes two pieces of chicken and 1/4th of the vegetables. I use parchment for easy clean up, do not use foil as the vegetables will stick to it. nutrition calculations do not include the optional toppings of almonds, yoghurt, or cilantro.